Windows 10 is just about here -- and many users (especially those who have been wrestling with Windows 8) are probably eager to upgrade. But even if you can get it now -- the upgrade will be sent first to those who signed up for the Windows Insider beta program and then in "slow waves" to everyone else -- you may want to hold off. Here are nine reasons you might want to put off a Windows 10 upgrade. This may seem obvious, but sometimes it's the obvious that gets missed. In order to run Windows 10, you need a PC or tablet with a 1GHz processor or faster, 1GB of RAM for 32-bit machines or 2GB for 64-bit machines, 16GB hard disk space for 32-bit machines or 20GB hard disk space for 64-bit machines, a DirectX 9 or later graphics card with a WDDM 1.0 driver and an 800 x 600 display or better. For more details, go to Microsoft's Windows 10 specifications page. 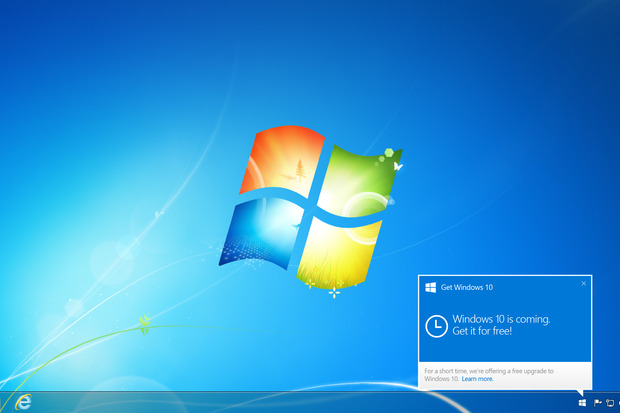 Windows 7 and Windows 8 users get a free upgrade to Windows 10. But you don't have to upgrade right away -- you have a full year. (The clock starts on July 29, 2015.) So you can upgrade at your leisure and not waste a bright, summer day doing it. Windows 10 undoes the damage done by Windows 8, an operating system that was built more for touch devices than for traditional PCs. In fact, two of Windows 10's big improvements over Windows 8 are the addition of a Windows 7-style Start menu and the ability to work entirely on the desktop and ignore the touch-focused Start screen. So if you currently use Windows 7, you're already set -- you have a Start menu and you work only on the desktop. In short: If you're happy with the way Windows 7 works, you may want to stay with it. Windows 7 includes desktop gadgets that do things such as check the weather and stock quotes, monitor your CPU, report about the state of your system, let you listen to streaming radio stations, and check your hard drive speed and the state of your network. They don't work on Windows 10 and will be deleted when you upgrade. So if you're a gadget fan, don't upgrade. Microsoft has a habit of pushing people to its latest operating system by ending support for its old operating systems, halting security updates and leaving users potentially open to security threats. If you have Windows 7 or Windows 8, you've got years before that happens. Microsoft will keep issuing security patches for Windows 7 until January 2020 and for Windows 8 until January 2023. Even Windows Vista will get security updates until April 2017. So no need to rush. In Windows 8.1, OneDrive placeholders, also called smart files, let you see all of the files in OneDrive, even if the files are located in the cloud and not on your device. When you double-click a placeholder on your PC, the file is downloaded. However, when Windows 10 ships, OneDrive placeholders won't work because of the upgraded OneDrive software. Microsoft says it will try to bring OneDrive placeholder functionality to Windows 10 by year's end. But if OneDrive placeholders are important to you, don't upgrade until they work with Windows 10. The Achilles heel of most new operating systems is handling older peripherals, such as printers and scanners. Microsoft doesn't always make sure that drivers for vintage devices work with the new operating system -- it would take too many development resources. As a result, some of these peripherals won't work with newer operating systems. So if you have old favorites with a lot of mileage on them, don't upgrade right away. Scour the Internet for news of whether they work with Windows 10, and only upgrade to it when you know that they do. Yes, it's true -- there are some people who are big fans of Window Media Center, which was released way back in 2002 and which is used to play video, music and other media. Microsoft has been trying to kill it off for years, and even disbanded the team responsible for it back in 2009. The truth is, Media Center was always a nightmare to set up and has been superseded by streaming media services such as Netflix, Amazon Prime, Hulu, Spotify, Apple Music and many others. Still, there are die-hards out there who love it -- and who will be dismayed to learn that Windows Media Center won't work with Windows 10. If you're one of that group, stay away from upgrading. No matter how widespread beta testing is for a new operating system, it can't uncover all the bugs and gotchas. A new operating system hasn't been tested on every possible piece of hardware, with every piece of software, and with every hardware/software combination. People who upgrade immediately are the guinea pigs. They're the ones who feel the pain. If you'd prefer to go with an operating system that's had enough time for a shakedown cruise, wait another six months before you upgrade.